To fully go into my thoughts on Everything, Everything, I have to give full details about certain plot elements. I know it’s mostly unethical for reviewers to write full-on spoiler heavy reviews, but there’s so much to say about certain aspects of this film that I really cannot summarise it without the proper context. So be warned, this review contains spoilers, so if you’re keen on seeing this movie and don’t want it ruined for you, then I would advise you to stop reading and go see it for yourself… then come back here and realise what a terrible mistake you’ve made. Okay, so Everything, Everything… crikey. I’ll be honest, I’ve not seen a thoroughly misguided and unintentionally frightening movie like this in years, and keep in mind I saw The Book of Henry not that long ago. On the surface, it seems like just another disposable cheesy teen romance made in the wake of The Fault in Our Stars’ success, but when you dig further down you’ll find something rather disturbing and troublesome, with certain plot twists and revelations that are not just ridiculous but morally reprehensible – and I was quite shaken by what I found. So the film is about Maddy (Amandla Stenberg), a teenager who when we are first introduced to her is living within the safety of her heavily-secured home. We learn that she has a rare immune-deficiency disease known as SCID that prevents her from going outside and interacting with anyone that isn’t her mother (Anika Noni Rose) or her nurse (Ana de la Reguera), and understandably she’s rather bored to her confined lifestyle. She soon notices a new family moving in next door, including fellow teen Olly (Nick Robinson) who she soon strikes up a text conversation with, and generally begins to seriously fall for. That provides Maddy with the inspiration she needs to defy her mother’s wishes and concerns for her safety and finally step out into the open, even travelling with Olly to Hawaii (according to this film, credit cards are SUPER easy to get a hold of) and, as par for the course in a lot of these teen romances, falling for her new friend even harder. And then, things start to get seriously messed up. Are you ready for this? Are you ready to hear what makes this seemingly innocent movie so goddamn hard to watch in its last third? It turns out that Maddy never had SCID in the first place, and that her mother was keeping her in the confines of her own home under false pretences because she doesn’t want to let her go. That was pretty much my reaction, and can you blame me? Right there and then, as that twist is gradually revealed, this movie turns into an unintentional horror film, specifically the kind where someone is held against their will and essentially brainwashed into staying there, by a seemingly kind figure who turns out is all sorts of wrong in the head. Of course, it doesn’t go full horror mode in the end, as she does run off as soon as she discovers the truth, but the ideas and rational thinking behind this are still present and (in)correct, making it an extremely discomforting thought that this was the situation that whole time. I mean, imagine being in that situation where you are pretty much imprisoned and told that you will most likely die should you venture outside, only to much later find out that they were lying straight to your face and that they have no intention of letting you go for any reason. It’s pretty chilling, isn’t it? What makes it even scarier is that all throughout, Anika Noni Rose plays the mother character like a smiling sociopath, even in scenes where it’s completely unapparent what she’s really plotting. For the most part, she acts all calm and collected, saying even the most passive aggressive things with a relaxed smile; and when it’s finally unveiled what her real intentions were, she acts even more like a deranged emotional psycho, and it wouldn’t be entirely out of place if she decided to go on a stabbing spree after her own daughter. It’s an extremely chilling performance, one that’s entirely unintentional and leaves you in a state of awe and disbelief that the writers could come up with a situation and a character that feel as though they should be in a much more sinister film than this. There’s really not a lot to say about the rest of Everything, Everything, other than it’s just another typical teen romance with a few extra quirks, some decent chemistry between the two leads, and the odd cheesy line. But dude, it goes from 0 to 100 fast in that last act, and it leaves you with more of a chill than a lot of the actual horror movies so far this year. It’s the one standout talking point (for better or worse) in a film that, for one with a title like Everything, Everything, is a whole lot of nothing, nothing. 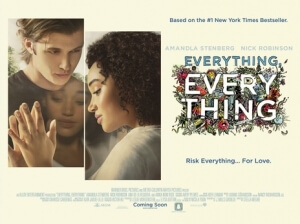 Everything, Everything is a typical cheesy teen romance with a few saving graces, but a third-act twist unintentionally turns the whole thing into a horror movie, in its creepy ideas and thoroughly misguided handling of said twist.